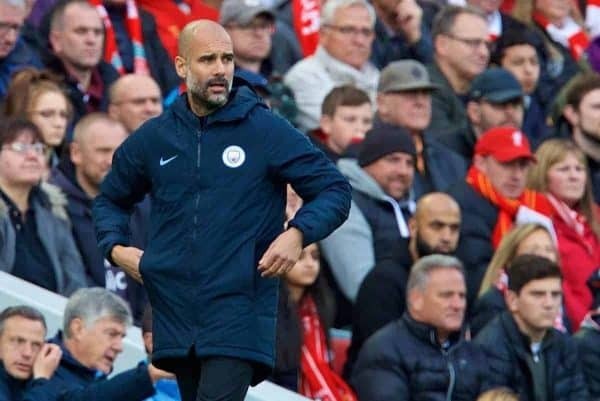 Pep Guardiola has urged Man City to retain focus on their own games, after they kept Liverpool’s lead at the top of the Premier League at four points on Monday. After the Reds’ 1-0 win at Brighton at the weekend, the pressure was on City to respond with a victory of their own at Molineux. Wolves had taken points off Man United, Arsenal, Chelsea and Tottenham already in the league, along with a 1-1 draw with Guardiola’s side back in August, leaving Liverpool fans hoping for another favourable result. But an early goal from Gabriel Jesus and a debatable red card from Willy Boly soon after put paid to that, with another from Jesus and an own goal from Kirkby alumni Conor Coady ensuring a 3-0 defeat for the hosts. Speaking after the game, however, Guardiola insisted the focus is purely on getting results, rather than keeping up with Liverpool. “We cannot play Liverpool so we can’t do anything about them—all we can do is win our games,” he told reporters. “We can control what we do and that’s being there, but if we won’t win, then they will be champions and I will congratulate Jurgen. “That’s why we have to win. We have incredible numbers after what we did last season. “I don’t have a crystal ball to know [how many points City will need]. 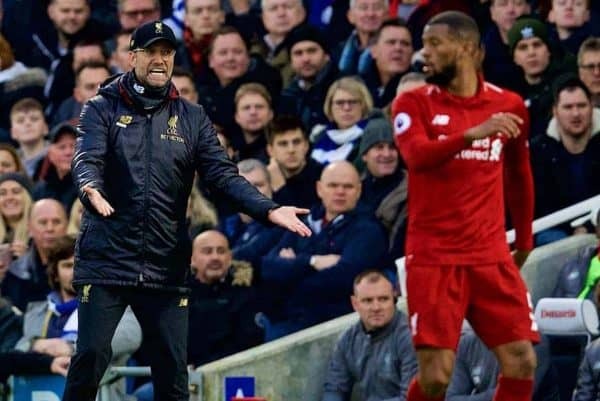 I said to the players: don’t watch the calendar for the Liverpool games because when that happens, you get distracted and lose games. This is the same stance Klopp has taken, with the German reiterating this in his post-match press conference at the Amex. 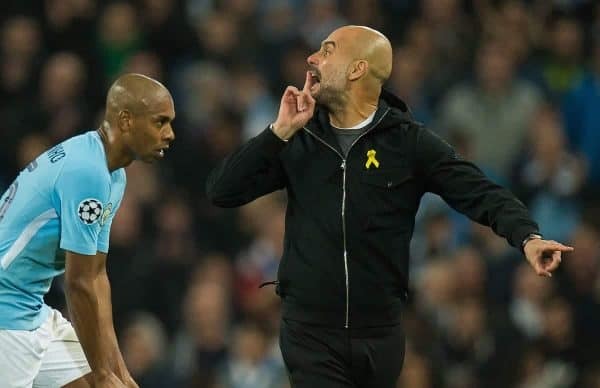 Interestingly, however, Guardiola did concede an element of weakness in City’s schedule, with their involvement in the Champions League, FA Cup and League Cup often seeing them play after their title rivals. And furthermore, he noted that with the departure of Klopp’s close friend David Wagner from their next opponents Huddersfield Town, there could be a bounce-back effect at the John Smith’s Stadium. “Our next game is Huddersfield and they’ll have a new manager. We have to focus on what we can do to beat them,” he continued. Before City take on Huddersfield in a 1.30pm kickoff on Sunday, Liverpool will have already played Crystal Palace, before the tables turn for the Reds’ clashes with Leicester and West Ham.